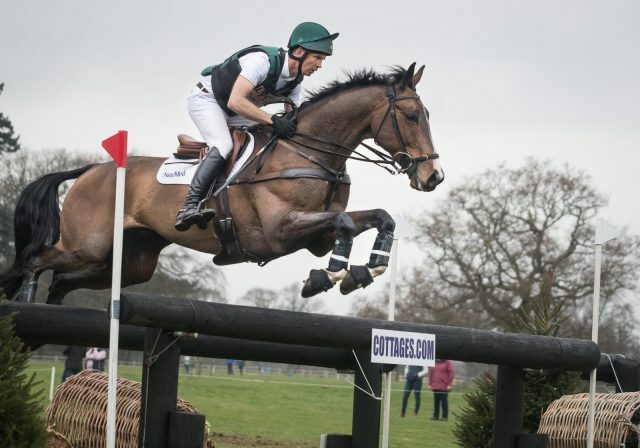 Jonty Evans and Cooley Rorkes Drift do the triple: a first run, first international, and first win of the season at Belton. Photo by Tilly Berendt. 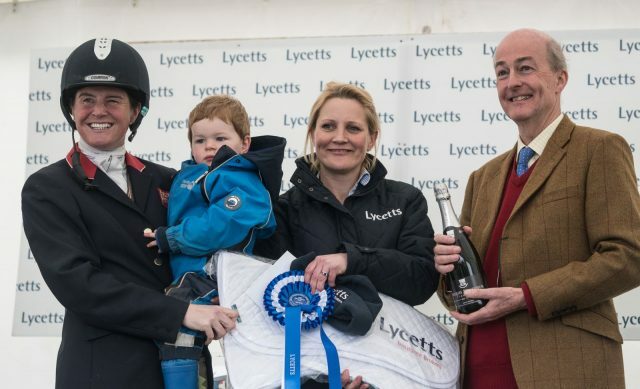 There wasn’t quite enough space at the prize-giving for all of Cooley Rorkes Drift’s 6800 ‘owners’, but they were certainly there in spirit as the plucky 12-year-old took the win in the Grantham Cup CIC3* with Jonty Evans. The result represented a long-awaited fairytale ending to the biggest story of 2017, in which Evans crowdfunded approximately £500,000 to secure the horse. Evans’ fundraising efforts came down to the wire, and so did his fight for victory today. The pair were equal sixth after dressage on a score of 28.8, with overnight leaders Pippa Funnell and Billy Beware sitting comfortably nearly four points ahead of them on 24.9. But he put the pressure on early in the day with an easy clear round over the poles, proving that a winter of intensive training with coaches Ros Morgan and Ian Fearon had paid dividends. 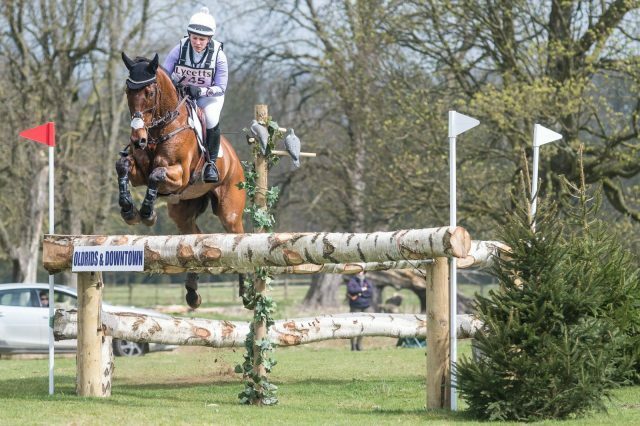 Allergic to wood: Art makes light work of the CIC3* showjumping. Photo by Tilly Berendt. Captain Mark Phillips‘ testing track asked many of the questions that the Badminton track will ask in three short weeks’ time – and as Jonty pointed out on Friday afternoon, any horse who was able to be competitive over it would find itself well prepared for the Gloucestershire event. And so the pair, whose spring season, like so many, has been plagued by cancellations, set off to make their first run of the season as positive as possible with just that end goal in mind. From the moment they left the start box, they never looked like faltering, and in a class where no one made the time, they added just 3.6 time penalties to put the pressure on the top contenders, all of whom were to jump much later in the day. Jonty and Art over the Fentons Trailer. Photo by Mace Maclean. The latter half of their 2017 season hadn’t gone exactly to plan – fractured by the intensity of the fundraising campaign, they found themselves facing the major events of the autumn under less-than-ideal circumstances, and errors across the country at Blenheim and Pau were made perhaps more profound by the knowledge that the eyes of the world were on them. Jonty, for his part, wanted to give his myriad supporters – Art’s extensive family – a result in which to indulge, and the horse, too, the top results he knew he was capable of. But when things go pear-shaped, the long winter months are the perfect time to step back, regroup, and work on getting things in order – and work they did. Jonty and Art clear the final element of the sunken road. Photo by Tilly Berendt. Jonty had had the opportunity to ride the course earlier in the day on two of his talented young horses, Clara M and Ringwood LB, who finished 12th and 9th respectively in the other CIC3* section on their debuts at the level. Now, his focus moves ahead to Badminton, at which the horse made a promising debut last year. The strategy? Well, more hard work, of course. An emotional victory for Jane Moss and Jonty Evans. Photo by Tilly Berendt. 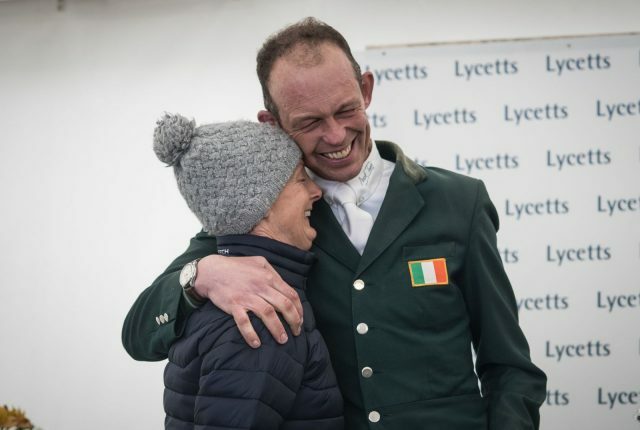 The support that secured Jonty his horse of a lifetime was evident across social media, as hundreds of fans tuned in to the live stream to cheer the horse they helped buy across the finish. Jane Moss, who now owns Art along with Elisabeth Murdoch and Jonty, joined the rider for the prizegiving and graciously represented the masses. Perhaps it would be amiss to call today’s victory a fairytale ending. 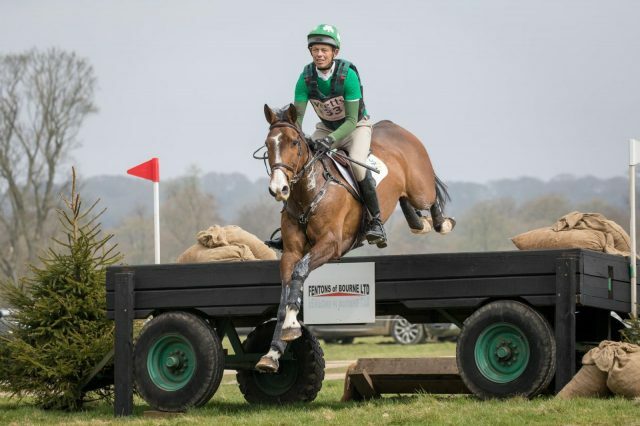 As the season begins in earnest, it’s a better sort of story altogether: it’s a fairytale beginning to what looks to be an exciting season for the eventing community’s adopted mascot and his thoroughly deserving rider. Ireland’s Padraig McCarthy and Mr Chunky post a clear round on their Badminton prep run. Photo by Tilly Berendt. 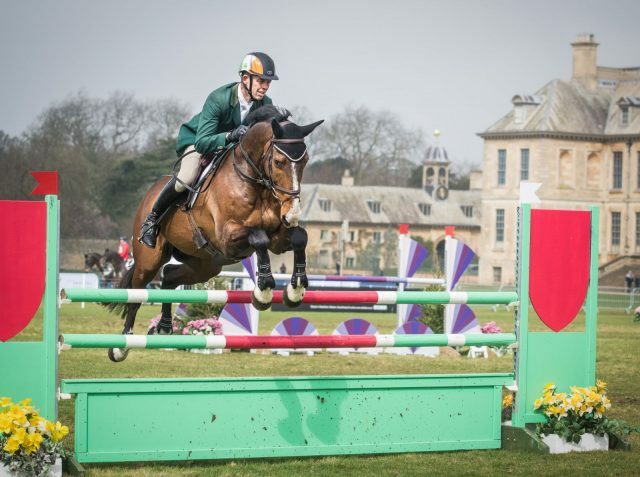 Team Ireland enjoyed a fortuitous day all around at Belton, with a host of classy clear rounds from its riders and a full support system on hand. 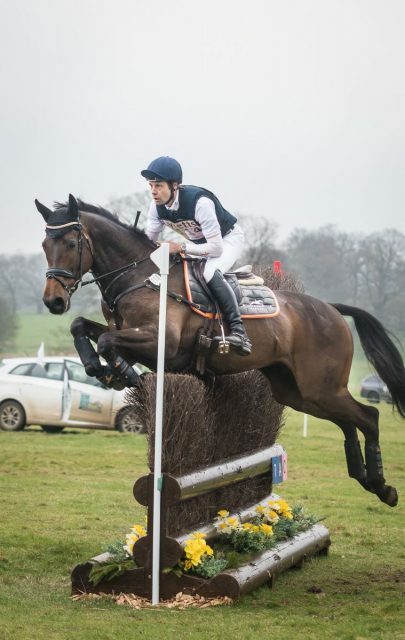 They send forth a strong field of riders to Badminton, all of whom showed great form today – a fantastic start to the year, and one which will surely inspire backers as the team continues to raise crucial funds for the World Equestrian Games later in the year. Piggy French and Vanir Kamira blow away the cobwebs in time for Badminton. Photo by Tilly Berendt. 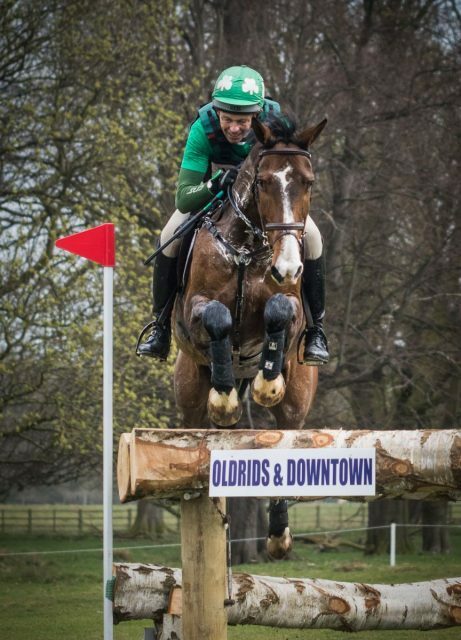 Badminton-bound horses represented the top four placings in the class. Piggy French and Vanir Kamira looked impressive across the country and finished the day in second place – the same spot they occupied at Burghley last year, and by similarly slim margins. They sat just a tenth of a penalty behind Jonty and Art after dressage, and added nothing in the showjumping, but 4.8 time penalties in the final phase pushed their score to 33.7, just 1.3 points behind the leaders. Piggy French – second place in the Grantham Cup. Photo by Tilly Berendt. The course certainly played its part in blowing away those cobwebs. Piggy also finished in ninth place aboard Europeans mount Quarrycrest Echo. “Pretty much perfect”: Pamero 4 and Gemma Tattersall hit their stride for third place. Photo by Tilly Berendt. One of 2017’s most exciting new partnerships lodged its best placing yet today. Gemma Tattersall and Pamero 4 challenged for the win and added just 4.4 time penalties to claim third place on a finishing score of 34. 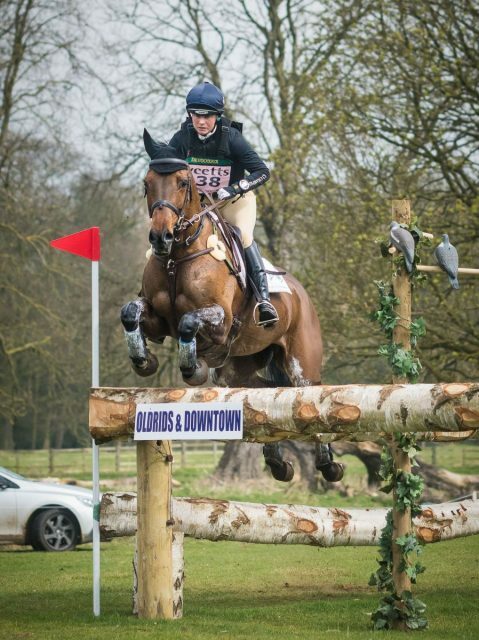 Pamero 4, who was produced by Laura Collett through the three-star level, will make his Badminton debut next month. Despite being a fledgling partnership, Gemma and the eleven-year-old Hanoverian have finished in the top ten in all five of their international runs together. Arctic Soul gets a wake-up call in the CIC3* with rider Gemma Tattersall. Photo by Tilly Berendt. 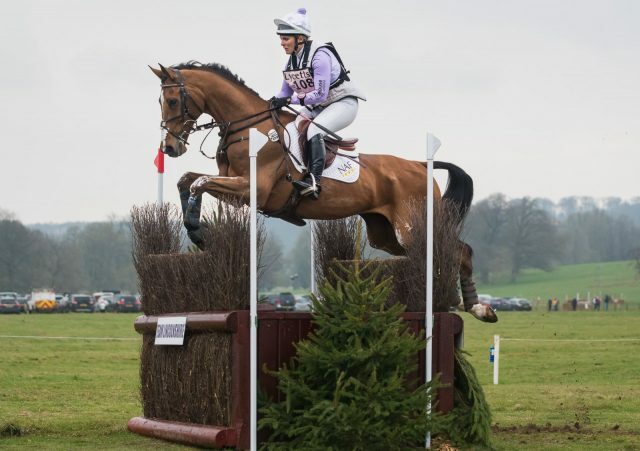 Gemma’s day didn’t quite go to plan with top horse – and fellow Badminton entrant – Arctic Soul. The pair picked up an uncharacteristic 20 penalties after they glanced past the final element of the coffin complex, and a further 49.2 time penalties as Gemma opted to use the remainder of the round as an exercise in control and cooperation. “Nothing really went wrong – Spike just thinks that he can do it all by himself! To be honest, it’s a relief – the horse hasn’t had a cross country fault in such a long time, and everyone says that he’s a machine, and we’re a machine together, and actually, we’re not – things happen! At the end of the day, he’s a horse, and he has his own mind. He’s an older horse now, he’s jumped around a lot of big tracks, and he just thinks that he’s the bee’s knees and can do it all by himself. It was a bit of a shock for him today when couldn’t jump out of the Lycetts Leap, and he’s feeling very sorry now – he’s a bit coy with me, and a bit embarrassed, I think! His stablemate is getting all the attention and he’s not. I hope that this sharpens him up and helps him realise that he can’t conquer the world by himself – because he does really think that, and I think you’d need to make a five or six-star for him to back himself off. No fence you could build would ever be too big for him – he’s a freak of a horse, he’s incredible, and he’s on amazing form and very strong in his body. He’s just feeling too well – he needs to go spend a few nights out in the field,” she laughs. Purdey shows her Quality with a sixth place finish in the Grantham Cup. Photo by Tilly Berendt. One of the final horses to run was one of the closest contenders for the title. Equal sixth with Jonty and Art after the dressage, Chris Burton and Quality Purdey produced a clear round over the poles and made easy work of the cross-country course. Chris is renowned for his blazing speed in this phase, and also for his precision and confidence at a top pace, and so, with room for nine seconds over the optimum time, it looked as though he would do it. It was close, but no cigar – they added eight penalties to finish in sixth place, giving the mare a productive prep run for her spring CCI at Saumur. “It was never the plan to go fast here, as everything is geared on Saumur, but that cross country round was mega and they were just in cruise control,” enthuses owner Dom Poole. 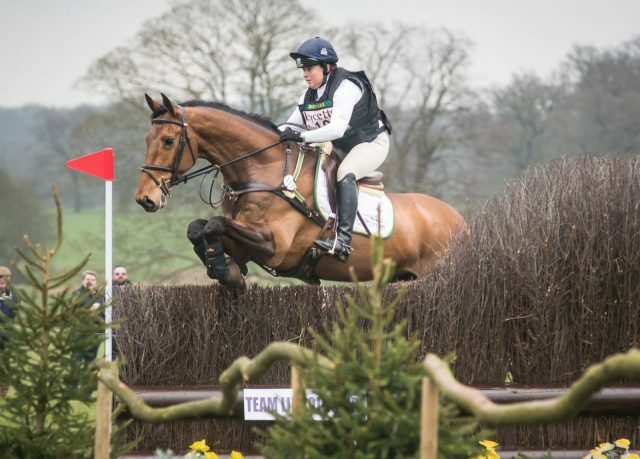 Joining the big leagues: Billy Walk On proves an exciting prospect for Pippa Funnell. Photo by Tilly Berendt. And what of overnight leaders Pippa Funnell and Billy Beware? 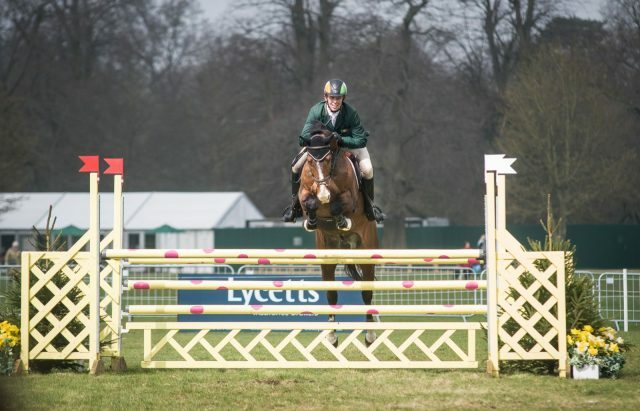 A run-out and a spate of time penalties pushed them out of contention for the win, and turned their cross-country round into a training exercise, but last on course Billy Walk On showed maturity and confidence that belied his relative inexperience. He was Jonty and Art’s last hurdle on the route to the win, and Pippa set a good pace, but it wasn’t quite enough – they added 12.8 penalties to finish in the top 20. Now, all attention shifts onto Badminton. We’ll be taking a closer look at what each of the entrants got up to this weekend across the sections – and what it could mean for their chances in three weeks time. Stay tuned, loyal EN-ers – we’ll be bringing you all you need to know. For now, from the grounds of Belton House (they wouldn’t let us in the house, for fear we wouldn’t leave) – so long, farewell, and Go Eventing! 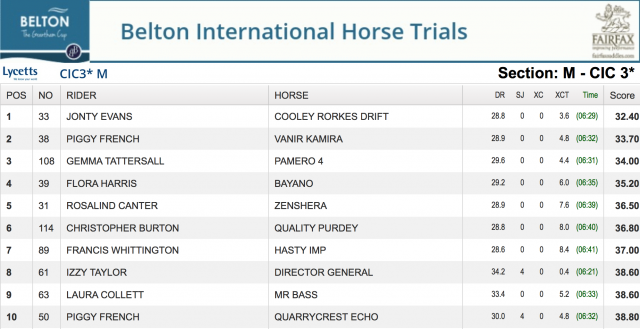 The top ten in Belton’s Grantham Cup CIC3*.